What Birds Can Talk and Live a Long Time? Sharing your home with certain birds is truly a lifelong commitment. Most pets don't live as long as humans do, but some live longer than you'd expect. Certain captive birds are among them. While many common caged birds live less than a decade, some live 20 years and others, believe it or not, can live more than a century. A bird with such longevity will be an integral part of your family. With a bird of certain long-lived species, you'll have a lifelong talkative companion. African gray parrots are very smart birds, all gray with a short red tail, who talk up a storm and can live as long as 65 years. However, 25 years is more the norm. The African gray usually shows a preference for one particular family member, to whom he bonds closely. Not only does the African gray pick up a lot of language, he appears to understand certain concepts. According to the petMD website, this bird appears to have the intelligence level of a human toddler. He's also a good mimic -- be prepared for imitations of the phone ringing, popular TV commercials and the like. Not all blue-fronted Amazon parrots boast blue feathering. These birds speak and sing very well. Specimens can live as long as 100 years, although most don't live past 80. The downside is that certain blue-fronted Amazons, especially males, display aggressive behavior. This is especially true during their "hormonal" years, from age 5 to age 12. While cockatoos can talk, they can also scream. That usually results from socialization issues, or the owner inadvertently training the bird by giving it what it wants when the screaming starts. Leaving the room and turning off the lights is one way of trying to get screaming under control. While the average cockatoo can live as long as 40 years, individual birds have lived twice that time span. Among the largest of the parrots, macaws appear in various shades and color combinations. If you're particularly looking for a talker, consider the blue-and-gold macaw. 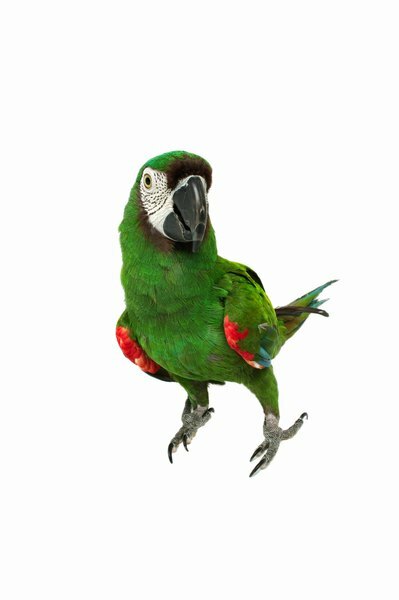 All members of the macaw family vocalize to some extent, so your bird might imitate noises in the home, or whistle, or meow like the cat. Like all parrots, these intelligent birds need lots of attention. However, the macaw might be less prone to behavioral problems than other parrots. Smaller macaws can live as long as 40 years, although their average is 25; larger birds might reach the age of 80, although their average is 40. Literally dozens of pet birds talk and live a long time. Even your average parakeet can learn language and stick around for 20 years, although eight years is more likely. Most parrot species talk to some degree and have relatively long life spans. Before purchasing a bird or bringing it over state lines, make sure it is legal to own the animal in your state. For example, quaker parrots, also known as monk parrots, are excellent talkers who live for 20 years on average and can make it into the 40s. However, they are illegal in some states, as loose parrots have formed flocks considered threats to native wildlife and agriculture. The keys to avian longevity include good nutrition and husbandry, as well as regular visits to a bird vet. The disadvantage to a long-lived bird is that it might outlive you. As you and your bird age, make arrangements for someone to care for your pet after you're gone. When making estate plans, ask your attorney about setting up provisions for bird care. Don't assume a relative or friend will care for your bird -- always discuss the subject with them beforehand. BirdChannel: Where Can You Own a Quaker Parrot? Can Cockatiels Live by Themselves?